The origins of the Adult Schools movement lay in the Nonconformist revival of the second half of the nineteenth century, when members of the Society of Friends (Quakers) in several British cities established Sunday morning schools to instruct the working-class population in reading, writing and Bible study. It was also hoped that the students might be attracted into membership of the Society of Friends. The later nineteenth century saw a consolidation of the regional and national organisation of the Adult School Movement and County Unions of Adult Schools were established. The National Council of Adult School Unions was formed in 1899, and renamed the NASU in 1914. The movement provided undenominational, but religiously-based education. 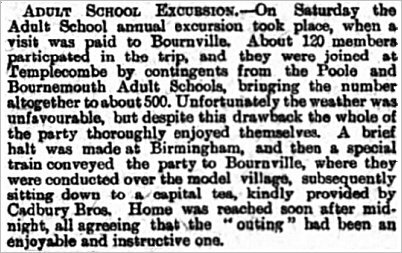 The 1907 newspaper report below records that 120 members attended the annual Adult School Excursion to Bourneville, suggesting that numbers at the school were even higher. The Women's Adult School was advertised in Collins' 1907 Directory. The school met in the Hendford Parish Room; the President was Mrs WA Hunt, the Secretary Mrs JN Fudge and the Treasurer was Miss Chapman. Whitby's Yeovil Almanack Advertiser of 1912 noted that the Women's Adult School met every Friday evening at Holy Trinity Mission Hall at 7:30pm. The President was Mrs AS MacMillan, the Secretary was Mrs S Willie of Sherborne Road and the Treasurer was still Miss Chapman. The Yeovil Men's Adult School met on Sunday mornings in Hendford Parish Room. The President was Mr PW Petter, and the Hon. Secretaries were Mr AS MacMillan and Mr S Burt. The Yeovil Adult School Orchestra gave Saturday evening concerts in the Town Hall during 1905 - admission 2d. Adult Schools were hampered by their association with Victorian philanthropy and the numerical strength of Adult Schools fell away considerably after 1910 and the Adult School movement as a whole went into rapid decline in the interwar period. A report on the annual Adult School Excursion from the 11 September 1907 edition of the Taunton Courier. The fact that 120 members from Yeovil attended intimates that the Yeovil Adult School was thriving. 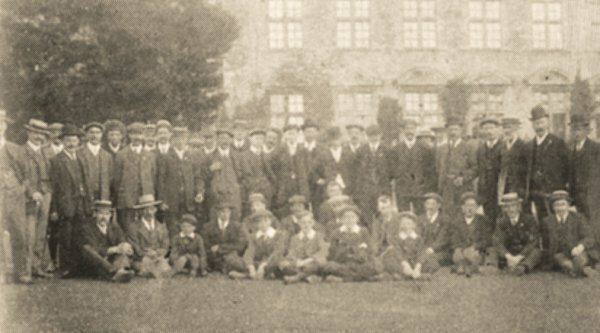 Men and boys of the Yeovil Adult School pose for a photograph around 1907. Yeovil Adult School Sports Day, 25 July 1908. 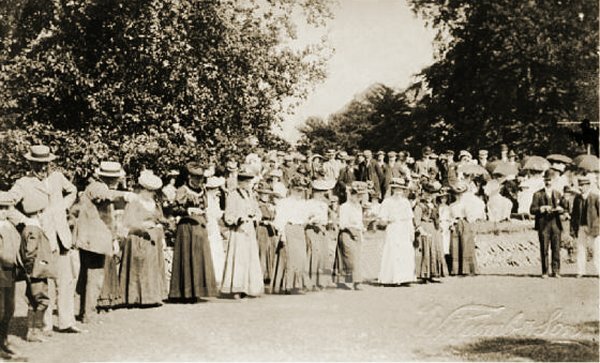 Ladies prepare for the start of the 'egg and spoon' race in the grounds of Hendford House (today's Manor Hotel). Members of the Yeovil Adult School relax on sports day. 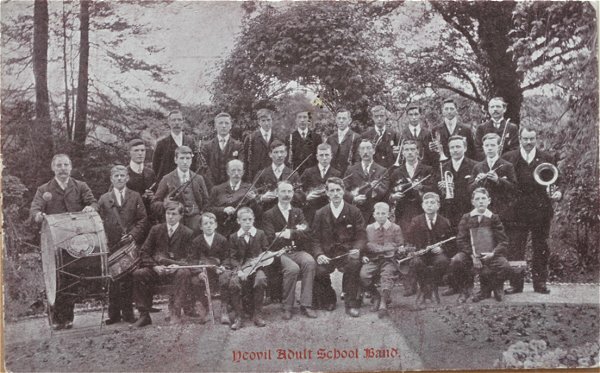 A postcard of the Yeovil Adult School Band, posted in 1907. 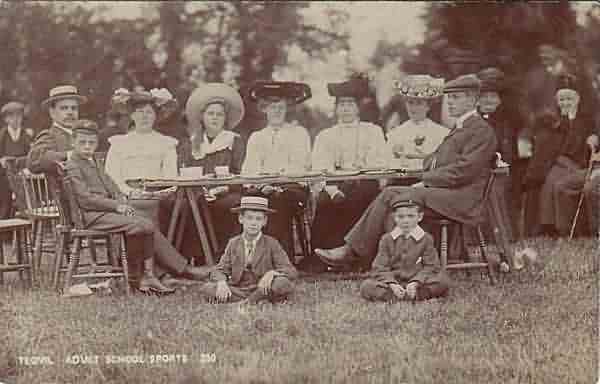 Seated at centre are the two school secretaries; Messrs AS McMillan and S Burt. 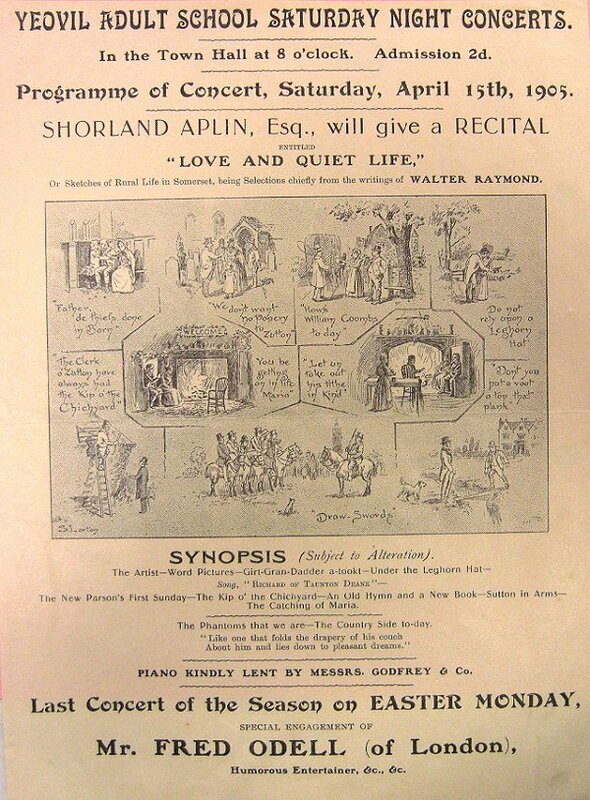 A poster advertising a Saturday Night Concert given by the Yeovil Adult School on 15 April 1905 and featuring a recital by Shorland Aplin and sketches of rural life based on the writings of Yeovil poet and author Walter Raymond - and I'm sure a cracking time was had by all. 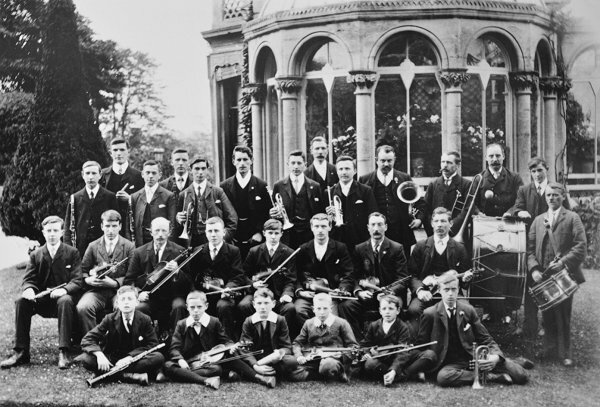 The Yeovil Adult School Orchestra, photographed around 1905.